This project was a tenant improvement for an established law practice with primary space planning concerns of privacy and security for clients, attorneys, and support staff. The 4,000 sq. ft. office includes two conference rooms allowing attorneys multiple circulation patterns and a choice of room size; private offices located along the building’s perimeter; a full eat-in kitchen; secure file storage room; and climate controlled server/wine storage. Each attorney’s office is equipped with bottom-up mechanical shades providing privacy from the street while allowing outdoor views. Newly constructed cherry bookcases were designed to match casework relocated from the original office. 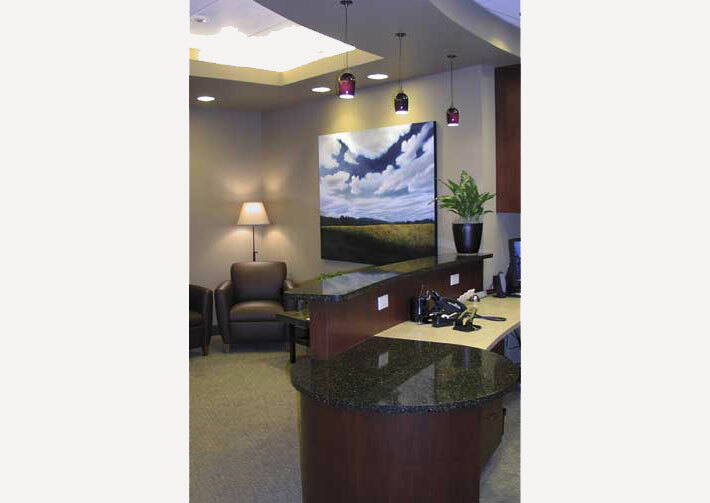 A curved reception desk, eight-foot tall doors, indirect lighting and warm accent color provides a comfortable and sophisticated interior design scheme. The private courtyard’s hard-scape was replaced with new brick paver stones and landscaping to create an inviting outdoor meeting area and outdoor views.